This entry was posted in History, Local Culture, Places and tagged Iraklion, Kazantzakis, Kazantzakis grave, Venetian wall. Bookmark the permalink. Very intriguing pic. Thanks for sharing. When I was in Iraklion, along time ago, I didn´t knew about that place. Well, then there is a reason to go there again! A beautiful photo, and fascinating information. Thank you. Fantastic view! Many years ago I was in Iraklion. But not on this place. The photograph and epitaph are so beautiful. 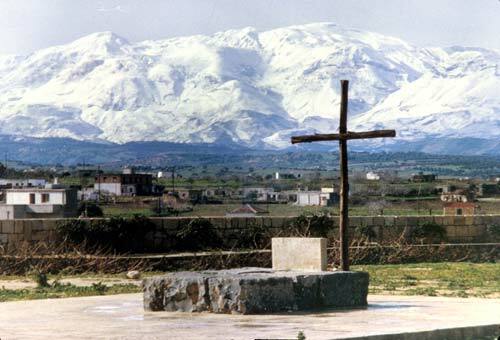 I love the way the stark headstone and cross look with the snowy mountains in the background. Love the cross with the awesome view behind it. A beautiful photo and beautiful words. Thank you for sharing such an interesting post. amazing how he got to be buried in probably one of the most unique highly visited sites in the area – this was not planned, but look at how it turned out for him! He was a wonderful writer and he deserves a beautiful resting place like this. Those snow-capped mountains are just drop-dead gorgeous!!! A beautiful photo. And a very interesting text!. He was wonderful writer! vol met interesante uitleg en prachtige foto’s. Ik kom zeker nog gluren ! A man of conviction, he deserved to ly where he can look to the snow covered mountains. What a wonderful photo! The landscape is so beautiful, I remember the film “Zorba the greek”….and the mountains …it really looks like a postcard! Wonderful photo!Thanks for stopping by my blog! Strong words in death, as in life. And a strong image, your photo. Hi! That’s very beatifull spot and great photo from it! Very nice that contrast. Just found your superb site after returning to Dublin City, Ireland, from Western Crete, where my heart remains [ Exopolis, near Giorgioupolis]. I took back from Rethymnon **Modern Greek Poetry** by the late Kimon Friar, and the equally good **Greek Poetry Translations** by Marios Byron Raizis. Highly recommended – the latter also has the Greek text. You cover such a great range of interest on your site – do continue. I recall his funeral when a giant of a man from Crete carried his casket unassisted on his shoulder up the hill to the gravesite where he gently lowered it into the grave. Now this site is overgrown with weeds and it is hard to find … The epitaph is almost illegible due to erosion and overgrowth covering it… So u must search hard to find it..most people around have no idea where it is either :).